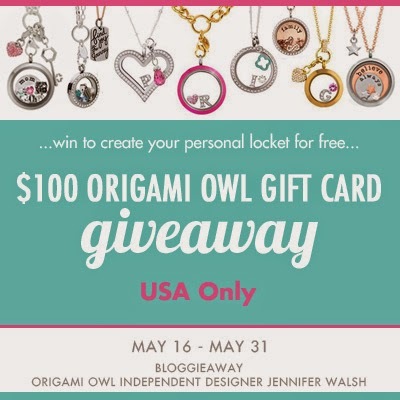 $100 Origami Owl Gift Card Giveaway! Ends May 31. Origami Owl is a custom jewelry online shop that offers jewelry that tells a story. “Living Locket,” as they call it, is a unique way to show your own personal story or unique personality in a fashionable way. So how does it work? In Origami Owl Website, (1) you will choose your charm/s, (2) then your locket, (3) then a chain, and that’s it! The locket is hinged and stays closed with a strong magnets that you can open anytime should you want to change or add more charms. Origami Owl has a variety of locket, chains, and charms that can represent both your story and style. You can even add beautiful dangles and tags. Check them out here. Origami Owl Independent Designer Jennifer Walsh is generously giving away $100 worth of Origami Owl Gift Card to one of our lucky reader! Enter using the rafflecopter form below. Giveaway ends May 31 at 11:59pm, open to US residents, ages 18+. Only one entrant per household. Winner is subject to eligibility verification. Good luck! I’m about to become a new mom, and I would love to document this new stage in my life and my new little one. I would love to get this as a gift for my mom! Thanks for the chance to win! They are so nice and very good for most occasions!